Are you looking for Gilmore Girls coffee? Then look no further! We've released a Gilmore Girls-inspired line of coffees called the Stars Hollow Coffee Collection. There are seven coffees in the collection, including inspiration from Luke's Diner, Mrs. Kim, Sookie St. James and Taylor Doose along with a seasonal coffee flavors inspired by the Town's Autumn and Winter Festivals. 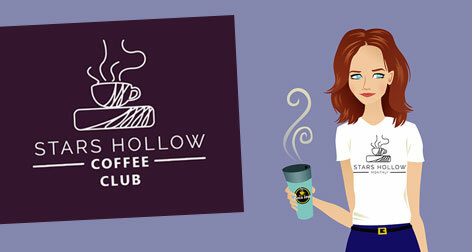 Join Rory and Lorelai as a new member of Stars Hollow Coffee Club. Members save money and get free samplers in every order.